The world’s most famous Venus flytrap detective is back on the case in author Tom Angleberger’s latest picture book installment, Inspector Flytrap: The Goat Who Chewed Too Much. In the book, someone seems to be stealing everything under the sun, including a pickle paper-weight, some gourmet cookie sprinkles, a famous painting called The Sistine Chap-stick, and even an invitation to the latest dog show. Inspector Flytrap finds his client list growing by leaps and bounds as he tries to help a slew of familiar characters who are missing important items, like Lulu Emu, Koko Dodo, Penguini the penguin of Penguini’s Linguini, and a snooty poodle named Zuzu Poodle-doo. 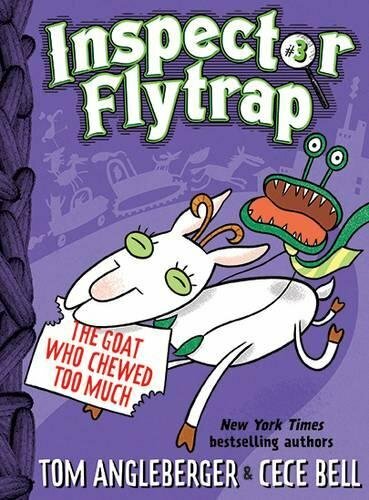 Unfortunately, all the clues about the missing items seem to point to Inspector Flytrap’s trusty, always-hungry assistant, Nina the Goat; and when she is placed in jail, he no longer has anyone to push him about on his skateboard so he can get from one place to the other. His only option is to depend upon the kindness of a slothful stranger—none other than the sloth reading a newspaper who appears in all the previous Flytrap books. The sloth’s super-slow movements impede the investigation and frustrate the poor Inspector Flytrap to no end, until the sloth suddenly reveals what he’s been up to behind the scenes. This is a cute little book that is peppered with just the right amount of humor to keep readers laughing all the way through. There are a plethora of hilarious characters, including a butler named MC FunkyFoot , an officer named Sergeant Sniff, and a host of other characters who either hinder or enhance the infuriatingly-slow search for the missing items. The book is also sprinkled with funny little charts and images, like the “Inspectorus dionaea muscipul exhibit” that identifies all the parts (even the “unmentionables”) of the Venus Flytrap known as the good Inspector; an image of Inspector Flytrap riding Nina the Goat like the Lone Ranger rode his horse, and the image of the “high classs 2-2 streamlined goat-powered cool-style skateboard” that Nina pushes the Inspector on. This one is a perfect introduction to nonsense and humor, and it is also great for supplemental reading for emerging readers who are learning to tackle longer pieces (this one has over 100 pages in total, though the chapters are only a page long). It is also a great way to introduce deductive reasoning and the art of studying clues. As always, the sketches by artist Cece Bell are full of fun and imagination and should keep readers smiling from beginning to end.